You can’t go to Key West and not get a Key Lime Pie. Everybody told us Blue Heaven was one of the best in town, so off we went. This Key Lime Pie is made like any other, with condensed milk, eggs and fresh lime juice atop a buttery graham cracker crust, but the mile high meringue is what sets this pie apart. It’s just so fluffy. If you follow me on Instagram, then you know I love tacos more than the average person. So obviously this was a necessary stop. To be honest, we loved Amigos so much the first time, we came back the next day. This is a great late night spot because it stays open late and is right near all the fun bars. But don't let that stop you from going for lunch or dinner. My favorite tacos were the shrimp and carnitas, but everything that we tried was great. The tacos are served on fresh, square corn tortillas, which I thought was a unique twist. So many people recommended DJ’s, so we went. 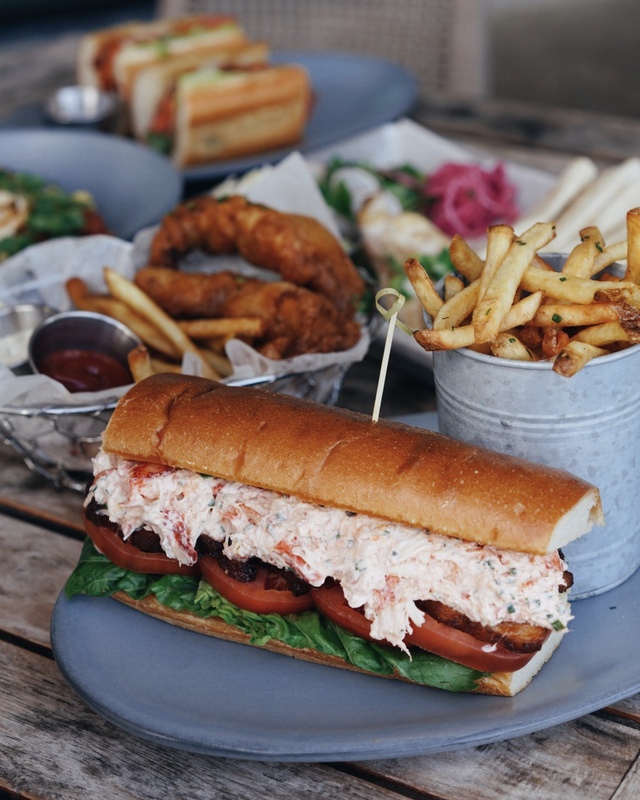 We got the overstuffed lobster roll (yes you can order it regular or “overstuffed”) and it was a beauty. Even @eastcoastfeastcoast, a New Englander who has had some amazing lobster rolls, loved it. This outdoor café was a great stop. The seating is very limited, but the food is awesome. One of our favorite dishes was the conch salad, which is served ceviche style with tortilla chips. We also got the mac ‘n cheese because who doesn't love mac ‘n cheese. If you are still hungry after eating at Fisherman’s, Kermit’s Key Lime Pie shop is right across the street. They serve a more classic style key lime pie, but they also offer other fun things like chocolate dipped key lime pie. This little walk-up Cuban coffee shop is a must. The coffee was incredible. And so were the sandwiches. Get the Cuban Bagel - cream cheese on pressed Cuban bread with honey and everything bagel seasoning on top. Need I say more. If you’re craving doughnuts, this is the spot. Also snap a pic of the old theater next door for your IG. BO’s is the epitome of Key West. It’s a festive outdoor-restaurant, decorated in buoys, street signs, license plates and other fun things. It even has wild chickens roaming around, which you will see a lot of in Key West. This place is best known for it’s amazing fried grouper sandwich (or you can get it as a platter like we did). River Street Sweets is a candy shop famous for its pralines. Whether you have a sweet tooth or just like to look, this place is worth a stop. They’ll usually let you sample things before deciding what to buy, so make sure to take advantage of that. The image below is of their bear claws. First Flight Island Restaurant &amp; Brewery is located in the heart of downtown Key West. It’s well known for being the birthplace of Pan American World Airways, since Pan-Am’s first tickets were sold out of the restaurant building in 1927. Key West’s food and culture is influenced by generations of settlers from the nearby Caribbean islands. Turtle Kraals Bar & Restaurant celebrates the culinary blend of the tropics by delivering authentic Key West dining and cocktails in a distinctive and historic waterfront location. Enjoy a casual dining experience with beautiful views of the Key West Harbor. The restaurant serves breakfast, lunch and dinner as well as Sunday brunch with complimentary champagne. We stayed at 24 North, located at the entrance of Key West. The property is about 10 minutes outside the heart of the town, but the hotel has a pool, Starbucks, food truck and a free shuttle into Old Town that runs every 30 minutes. If you want to be in the heart of all the action, check out Margaritaville Resort. Everything you need is just a short walk away. The Perry Hotel is the farthest from everything, but also the most luxurious. Lazy Dog offers kayaking and paddleboard tours and classes. Hemingway lived and wrote in Key West for nearly 10 years. At the Whitehead Street property, guests can step back in time and visit the rooms and gardens where the Nobel Prize winner spent the most prolific period of his writing career during the 1930s. The Conservatory is filled with hundreds of nature’s most beautiful winged creatures. Guests can discover an impressive collection of flowering plants, colorful birds and cascading waterfalls and trees. Attractions also include a learning center where guests can explore butterfly anatomy, physiology, the lifecycle, feeding and migratory world of the monarch. ISLAMORADA - Robbie’s is a great spot for breakfast by the water. They have all the classics, like chocolate chip pancakes, eggs with hashbrowns, breakfast sandwiches, etc. After you eat, you can head over to the dock and feed the tarpons. Just watch out because the nearby pelicans can get a little aggressive when looking for food. ISLAMORADA - Eat dinner on the sandy beach under the lights. And make sure to ask for the drinks with the glowsticks! ISLAMORADA - The sunsets here are incredible, so make sure to snag a reservation at the right time. There’s live music and lots of people watching. KEY LARGO - Dolphin Point Villas is a getaway perfect for those who prefer an authentic Florida Keys experience. If you prefer to stay in a house instead of a hotel, this is the spot for you. We had a 4-bedroom villa all to ourselves. The villas are brand new, with modern finishes, high ceilings and lots of space to hang out. ISLAMORADA - We had some free time, so we decided to charter a fishing boat for the day. Not going to lie, I got a little seasick (like I always do when I go fishing), but we still had so much fun! We drank wine, caught fish and got a nice tan. Captain Wes and Captain Jeffrey were so kind and easy to work with. They made us feel like expert fishermen (which we definitely were not). BEER TASTING @ Florida Keys Brewing Co.
ISLAMORADA - This is a must stop. Not only can you get a massive flight of beer, but the setting is perfect. They have a colorful beer garden out back with swings, picnic tables and a giant Jenga set. MARATHON - If you need a break from eating and drinking, go check out the Turtle Hospital, which is where they rescue and nurse sick turtles. It’s informative and the turtles are adorable.